Every year, ESPN hosts the “Oscars” of sports, known as the ESPYS. It is the award show to honor individual and team accomplishments across all sports in the United States of America. Like any award show, there are many categories in which athletes, coaches, teams and specific moments are honored from the previous year. Ranging from “best male/ female athlete” to “Best World Breaking Performance” and other type of awards. 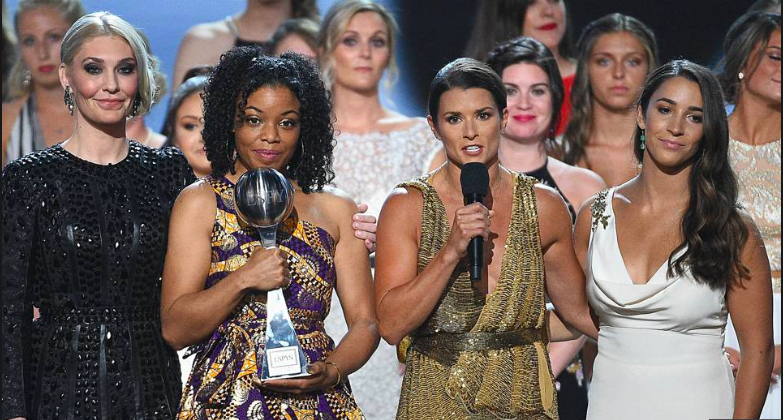 With Danica Patrick as host, this is the first year a woman has hosted the ESPYS. Check out the full list from the 2018 ESPYS here. A few highlights from this year’s award show, have honored groups of people not just for their accomplishments within sport, but their attitude and perseverance outside of sports as well. The “Jimmy V Award for Perseverance” went to Pro Football Hall of Famer Jim Kelly who has been battling cancer for 5 years now. “Pat Tillman Award for Service” went to Sgt. Jake Wood of the U.S. Marines (and former college football player) for his work in founding Team Rubicon that uses US military veterans to aid in disaster response and recovery efforts. The “Best Coach” award went to Aaron Feis, Scott Beigel and Chris Hixon who were coaches at Marjory Stoneman Douglas High School in Parkland, Florida. They sacrificed their lives to protect students during the shooting at the school last spring. Finally, for the “Arthur Ashe Award for Courage” the victims of Larry Nassar’s sexual abuse were brought out to be honored for their courage and strength in speaking out against the former doctor of Michigan State University and USA Gymnastics and for fighting against the pervasive culture that had allowed this behavior to take place. 141 “Sister Survivors” came out on stage in a powerful conclusion to the end of the ceremony. These athletes and coaches were honored, not just for their contributions to sport; but for their contributions to making the world a better place. Using their platform to make a positive impact on the world and remind all of us that strength and perseverance isn’t solely athletic.